Here you see two floods and MH highbays. Not sure the floods HPS or MH. Huh, they have the same floods near the Lowes near me. Did they replace the indoor lights at this location with LEDs yet? They did here but left these HID. They did the same thing when they went to T8 highbays in the mid-2000s. 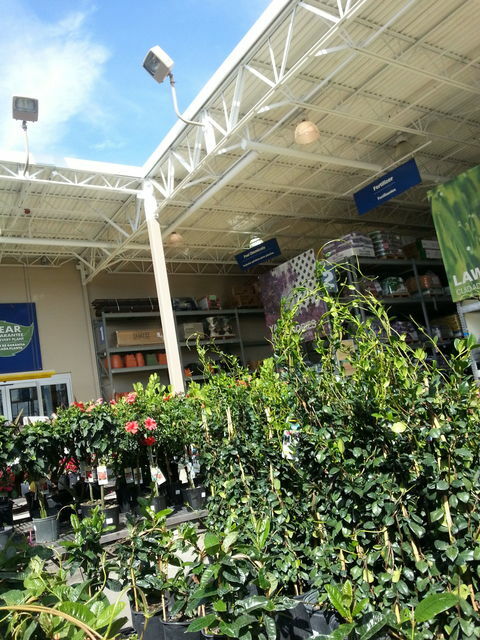 Home Depot did the same thing when they went from HID to 8ft T5 fixtures and then to LEDs here. The entrance vestibules still have MH canopy/garage lights. Feb 10, 2019 at 07:37 PM Author: Cole D.
Hmm I'm not sure, because I'm not good at telling LED tube from fluorescent. It does have those fluorescent highbays though, and I'm guessing that's what it had originally, since this Lowes opened in 2006. At the entrance vestibule I'm not sure though if it has MH highbays. But I know outside the front it has MH recessed lights and wall packs, but the wall packs aren't used at night. My local Lowes has the MH recessed cans too but had CFL tallpacks on either side of the entrance and exit doors. The indoor highbay lights were the same as the lawn and garden lights here but they were replaced by the six lamp T8 highbays not that long after the store opened. Probably around the time the first group-relamp would have been due. The new LED highbays at Lowes here are smaller and bluer than the fluorescents. My local HD went LED in April of 2018. They replaced all of the interior T5 lights (seems completely pointless since they are about the same in terms of efficiency), all of the 400w metal halide parking lot fixtures and lowbays in the greenhouse/garden center area, but they kept the 1kw HPS shoeboxes and 175w parking garage lights in the entrance area. My local Target also replaced their 1000w metal halide parking lot lights with LEDs a few days ago. It's noticeably dimmer and not lit nearly as well. Feb 10, 2019 at 08:02 PM Author: Cole D.
Lowes has MH lights in the parking lot. HD I'm not sure on the inside lighting, but garden center is MH. Entrance is all HPS wall packs, which I like since orange is their theme color. Parking lot is HPS also. Yeah all the Lowes here have MH parking lot lights too. The Home Depot I shop at has 1000W probe start MH parking lot lights but some others Ive seen have HPS parking lot lights. Home Depot here still has the 5' 3xT5-tandem fluorescents inside. And HID in the parkinglot. Inside, Lowes stores still have the 6xF32 fluorescents. Some of the Targets have converted their lots to LED, and all have LED inside.